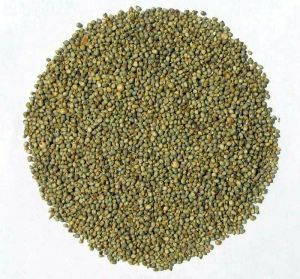 Pearl millet is the most widely grown type of millet. It has been grown in Africa and the Indian subcontinent since prehistoric times. The center of diversity, and suggested area of domestication, for the crop is in the Sahel zone of West Africa. ·	It is commonly consumed in the form of breads (whether leavened or unleavened), porridges and khichadi etc. When using for Bajra khichadi etc, soak overnight and then pressure cook with gren moong dal till soft. Temper with ghee and spices. This a traditional Rajasthani recipe. ·	When processed into a flour, it is used to prepare bajra rotlis, khakras, bhakri, stuffed parathas etc. ·	Use the flour to make healthy muthias, dhoklas, chaklis etc. 1. Eating bajra provides us with disease fighting phytochemicals that lower cholesterol, antioxidants, plenty of fibre, folate, iron, magnesium, copper, zinc, vitamins-E and B-complex, thiamine, riboflavin and niacin. It is a gluten free grain. It is noted for its high iron content. 2. Bajra has some medicinal properties when bread is eaten with honey in the morning. It is specially effective for bleeding piles, epilepsy, insomnia, impotency, high blood pressure, diabetes and tuberculosis. 3. It is easily digestible and has the lowest probability of causing allergic reactions. 4. Bajra, being gluten free, is a very good food choice for those suffering from celiac disease who cannot tolerate gluten. 5. It is highly effective and recommended for cases of severe constipation and stomach ulcers. 6. The presence of phytic acid and niacin in bajra helps in lowering the cholesterol.Being rich in fiber content , bajra is good for diabetics, keeping the glucose levels normal. 7. This whole grain supports weight loss as the high fiber content leads to a feeling of fullness for a prolonged period of time. 8. It is helpful in maintaining cardiovascular health and in acidity problems.